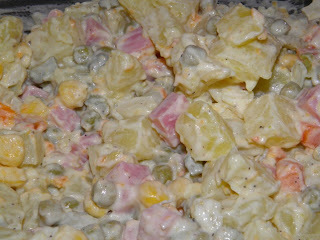 I am not sure if this is the "real" Olivier Salad (if there is one) as I didn't look up any recipes. 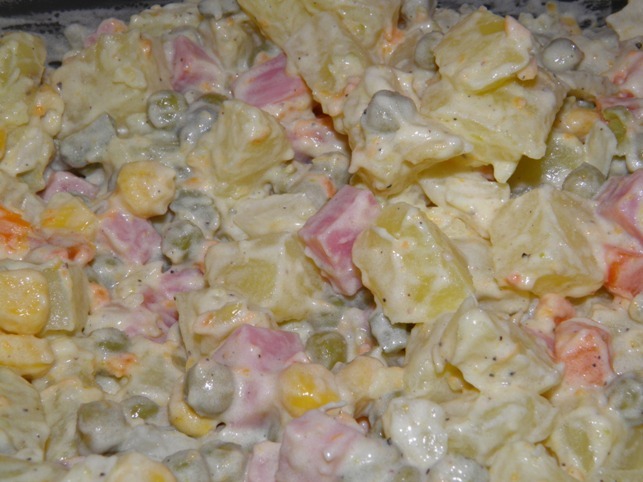 I had Olivier Salad before, so I just threw in whatever ingredients I could remember. It's not bad for this hot and stuffy Friday! But something seems to be missing. Now thinking about it, I think there may be apples and eggs in the salad too. I can't believe I always put off making this salad because the potatoes always break/mush after cooking - even when I got the waxy ones. So today I steamed the potatoes instead of cooking them in boiling water. And it works! I bet this may be a well known trick that I was not aware of, but am still very proud of myself for figuring this out. 1. Throw everything into a big salad bowl and mix well. Season with black pepper, and refrigerate for at least an hour.